The City of Fort Worth, Tarrant County and other taxing jurisdictions are committed to quality, thoughtful center city growth. For meritorious development and redevelopment projects, there are certain incentives available. The descriptions below provide a summary and links to more information. - Anchoring of a business expansion project with potential to generate additional supply chain activity. A significant public-private partnership that adds to the success of Downtown is the Downtown Tax Increment Finance District (TIF) and the other Downtown-oriented TIFs. The Downtown TIF makes strategic investments in parking, infrastructure, historic preservation, and residential development. 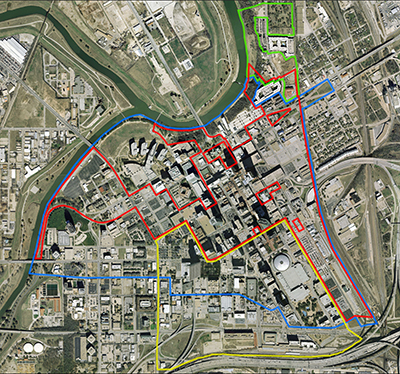 The TIF is a collaboration of the City of Fort Worth, Tarrant County, Tarrant County Hospital District, Tarrant County College District, and Tarrant Regional Water District. To date, the TIF has obligated $94 million, leveraging $543 MILLION in private development and facilitating $41 million in public investment. The purpose of these local grants is to reimburse private developers for the range of expenses that may contribute to a financing gap yielding projects financially infeasible. To this end, the city will also be sensitive to the taxable implications these grants may have for the developer and where possible, use transfer mechanisms (i.e., soft loans, accrual notes, etc.) which result in a favorable financial impact. A tax abatement is the full or partial exemption from ad valorem taxes on eligible properties for a period of up to ten years and an amount of up to 100 percent of the increase in appraised value (as reflected on the certified tax roll of the appropriate county appraisal district) resulting from improvements begun after the execution of the tax abatement agreement. Click here for more information about tax abatements offered by the City of Fort Worth. Brownfield sites are properties where expansion, redevelopment, or reuse may be complicated by potential or known hazardous substances, pollutants or contaminants. The new state historic tax credit is worth 25 percent of eligible rehabilitation costs and is available for buildings listed in the National Register of Historic Places, as well as Recorded Texas Historic Landmarks and Texas State Antiquities Landmarks. The TDHCA Housing Tax Credit (HTC) Program is one of the primary means of directing private capital toward the development and preservation of affordable rental housing for low-income households.